1. Why is Dayton called the Birthplace of Aviation? 2. How do I get to Dayton? 3. What airlines fly into Dayton International Airport? How far is downtown from the airport? 4. How large is the Dayton Convention Center? 5. How many hotel rooms does Dayton/Montgomery County have? 6. 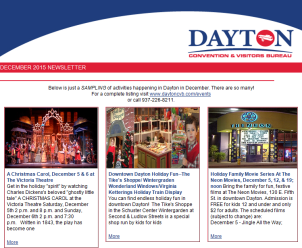 Can the Dayton CVB help me find a hotel and/or facility for my meeting or convention? Are your services free? 7. Where is the local Greyhound terminal? 8. Where can I obtain visitor information? 9. 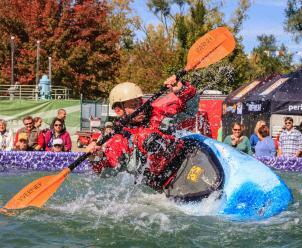 What activities/events are occurring in the Dayton area this week? 10. My question was not answered here. Who can I contact for assistance? Wilbur and Orville Wright grew up and lived their lives in Dayton. Dayton was where they first researched and experimented with flight and built their first airplanes. Huffman Prairie, an 84-acre field in Dayton, is where the Wright Brothers perfected their aircraft before and after their landmark flight in Kitty Hawk, North Carolina. Dayton is where the brothers opened the world’s first flying school and where they manufactured planes. The ingenuity and innovation of the Wright Brothers continues today at the research labs at Wright Patterson Air Force Base. Today visitors can experience the story of the invention of powered flight at the Dayton Aviation Heritage National Historical Park sites and at Dayton’s National Museum of the U.S. Air Force. Dayton, Ohio is conveniently located at what is commonly referred to as “The Crossroads of America”—the intersection of I-70 (East/West) and I-75 (North/South)—two major interstates that bisect the nation. 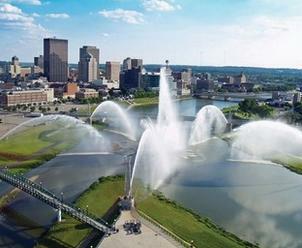 Dayton also boasts the Dayton International Airport which is serviced by all major airlines. The Dayton International Airport is an easy 20-minute drive from downtown Dayton. The Dayton International Airport is serviced by all major airlines. The Dayton Convention Center is a 150,000 square foot state-of-the-art facility located at Fifth and Main Streets in downtown Dayton. The Dayton Convention Center offers 77,000 square feet of uninterrupted meeting space which can accommodate 392 10×10 exhibit booths or 3,000 people for a banquet dinner. The Dayton Convention Center also offers a full-stage 672-seat theater and 22 meeting rooms. Spectra Food Services provides the in-house catering. The Dayton Convention Center is connected by a skywalk to the 287-room Crowne Plaza Hotel and to a 1,200-space covered parking garage. 5. How many hotel rooms does Dayton have? Dayton offers more than 6,500 hotel rooms in a variety of properties ranging from full service to limited service and budget. Regionally Dayton hotels plus those in the Greater Dayton area can provide approximately 15,000 rooms. View Dayton accommodations. The professional and knowledgeable staff of the Dayton CVB is eager to save you valuable time and money. We are pleased to help you plan your next meeting or event in Dayton and Montgomery County, and we’ll help you find Dayton hotels that are perfect for your needs. Please complete our short online Request for Proposal or contact a member of our sales team today for assistance. Once you&apos;ve signed a contract with the Dayton CVB, your group will be eligible for a list of services provided by us, free of charge! The Greyhound bus terminal is located in Trotwood at 2075 Shiloh Springs Road. You can contact them at 937-837-6251. The Dayton CVB operates a visitor center in our main offices, located on the first floor of the Dayton Convention Center at the corner of Fifth & Main Streets in downtown Dayton. The Dayton CVB also operates the visitor information station in the lobby of the Dayton International Airport. We also stock materials on area attractions, Dayton hotels, restaurants and more in the lobby of the National Museum of the U.S. Air Force. To have information mailed to you please Request a Destination Guide. If you have additional questions, please contact us. Visit our events calendar section for a list of activities planned throughout the region. Contact the Dayton Convention & Visitors Bureau and we’ll be happy to help. We can be reached by phone at 1-800-221-8235 (toll-free) or 937-226-8211.